The Board of Directors has the following 3 positions open for the upcoming 2019/2020 school year. All Board terms are for four years. Two Board-appointed positions. Board appointed positions are determined in May following the parent election. Nomination/registration for the parent-elected position is now open until March 29th. Online voting will take place April 12th - April 26th with results to be announced at the 7th May Annual General Meeting. Parents can find more information about the work of the Board, the role of a Board member and the election process including registration and registration forms HERE. 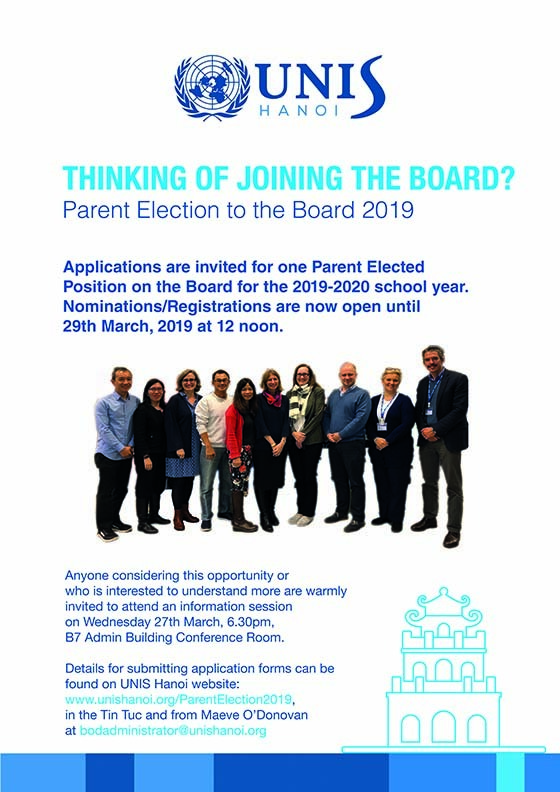 Anyone considering this opportunity or who would like to understand in greater detail the work of a Board member is invited to attend an Information Session About Board Service on Wednesday 27th March at 6.30pm, B7, room G015 (Conference Room in the Admin Building). The Board of Directors encourages all parents to consider putting themselves forward for election. The deadline for receipt of application forms is Friday 29th March at 12 noon. If you have any questions, please contact Maeve O’Donovan, Board of Directors Administrator, bodadministrator@unishanoi.org. Please consider joining us on the Board.